Standing 8611m and the second highest yet the most difficult mountain in the world . K2 also known as CHOGORI which is Balti language means the king of mountains need little introduction. K2 has variously be described as “awesome”, ” Killer ” and ” The Savage” mountain because of the massiveness of its size and unsuccessful attempts made on it by various expedition parties. This Summer of 2015 seen Irelands leading Mountaineer Jason Black from Co,Donegal take on the biggest climb of his life. The mountain has not been attempted by any Irish mountaineer since 2008 when Ger mcDonnell was the first Irish person to reach the Summit of K2. Regrettably Ger McDonnell lost his life along with ten other mountaineers following an avalanche on the descent, in the worst single accident in the history of K2 mountaineering. “summit success was the objective, however as true mountaineers we all know all to well, once you stand on top of these giants, it only marks the half way mark and success can not be fully realised until safe down”. Fifty of the worlds leading mountaineers were hoping for summit success in 2015 however mother nature had another plan and with extreme weather conditions the mountain allow no summit success for any mountaineer. 8611m standing as the second highest yet the most difficult mountain in the world and highest peak in Pakistan. K2 also known as CHOGORI which is Balti language means the king of mountains. K2 has variously be described as “awesome”, ” Killer ” and ” The Savage” mountain because of the massiveness of its size and unsuccessful attempts made on it by various expedition parties. The mountain has not been attempted by any Irish mountaineer since 2008 when Ger mcDonnell was the first Irish person to reach the Summit of K2, the second-highest mountain on Earth. Regrettably Ger McDonnell lost his life along with ten other mountaineers following an avalanche on the descent, in the worst single accident in the history of K2 mountaineering. “summit success is the objective, however as true mountaineers we all know all to well, once you stand on top of these giants, it only marks the half way mark and success can not be fully realised until safe down”. 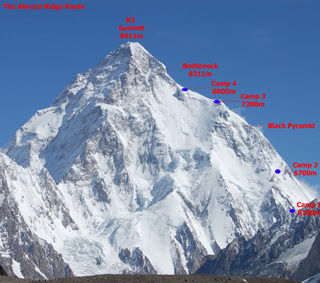 K2 known as the mountaineers mountain is the holy grail and the hardest climb in the world. The sporting qualities required to survive K2 is enormous, the physical & mental effects without doubt is the hardest endurance test in the world. For 76 days Jason battled against the sheer ability to stay alive. Jason Blacks commitment to this climb has be seriously intense since 2013 summiting Mt Everest north-face & returning from the Arctic 2014, he has worked tirelessly training twice a day for the last year putting in four hours daily, placing endurance & strength to the fore. Not common in other endurance sports is the sheer fact that if you generally stop you loose on K2 its very different yet very simple, you stop your dead. Earning its reputation “K2 The Savage”. The second highest mountain in the world—just 237 meters shorter than Mt. Everest—has a reputation for being far more hazardous than Everest, and the statistics don’t lie: Historically, for every 100 climbers who have made it to the summit of Everest, four have died. 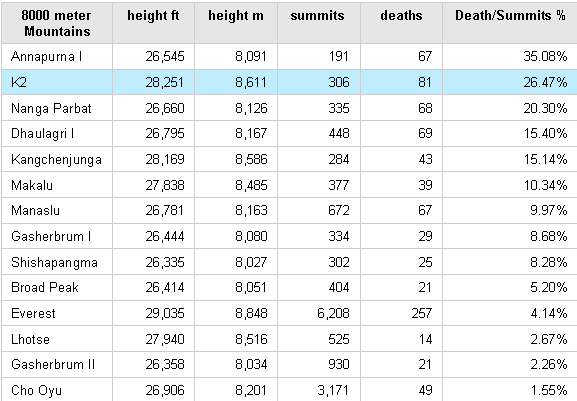 For every 100 climbers who have summited K2, 29 have died. A scant 306 people have ever stood on the summit of K2, compared to more than 5,600 Everest summiters. The weather is worse on K2. The climbing is more difficult, with two technical sections, House’s Chimney and the Black Pyramid. Once safely past those, climbers must navigatethe narrow Bottleneck couloir, forcing themselves underneath a set of massive seracs. Jasons route was the Abruzzi Ridge. There are several technically difficult features requiring skilled climbing. These include Houses’ Chimney, the Black Pyramid and the Bottleneck Couloir. There are no easy routes on K2. Day 01 Arrive Islamabad. Transfer to hotel for overnight. Day 13-64 52 days for acclimatization and climbing K2. Fly to Islamabad PK-452 (12:30 – 13:30). (Subject to weather). Upon arrival transfer to hotel. The most significant danger on K2 comes from rock fall and avalanches. The huge ice serac looming near the summit is the clearest objective danger as it can release large parts with zero notice falling directly on the most popular route. The rock fall is ever-present, sending large and small objects directly on top of climbers in the narrow gullies that cannot be avoided. The best helmets cannot protect climbers from these meteors. Also K2’s weather is notorious for its unpredictability and sudden development trapping climbers high on steep slopes. High winds can develop sweeping climbers off the high ridges, heavy snowfall can destroy fixed lines and escape routes plus accelerate the avalanche danger. Given the steep, icy and avalanche prone terrain, falls are prevalent. Some climbers fall even when attached to fixed rope but most are not clipped in, a mistake or perhaps unavoidable, slipping down steep icy slopes where self arrest is not an option. As if all of this is not enough to make any sane person avoid K2, there is the fact that climbers are above 20,000 or 25,000 feet, struggling for oxygen, pushing their bodies to the physiological limit climbing steep and dangerous terrain with no relief. Many climbers die simply from exhaustion, for lack of a better term. Best of luck, stay safe and well done on your upcoming attempt. ” Success is about following your dreams, achieving them is the bonus.” You have already succeed and I hope you collect the bonus. I’ll be following you with the pride of the Irish. Read it but did not see if Jason ever made the summit. How much did this trip set you back in terms of money? If you added up the flight, food, gear etc and time.